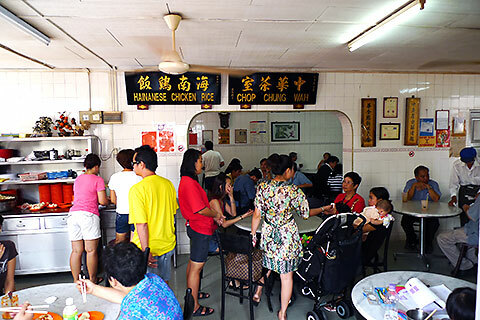 Melaka is well-known for its chicken rice balls and Chop Chung Wah is particularly famous for theirs. It’s located where Jalan Hang Jebat meets the Melaka River but it’s not hard to spot as there’ll be a pretty long queue outside it. Even in the blazing hot sun! The interior is very old-fashioned, like a coffeeshop from the 70s. The tables must be ancient, because their marble tops have been pitted deep. Here’s the old uncle, chopping away at the chicken while admiring the view…of a dusty road. One thing I have been spoiled by local chicken rice is that the chicken here is cut up neatly while here the chicken is just roughly chopped up into uneven strips. The meat is also tougher and stringier than the ones found back here, and Chung Wah uses a seasoning of mostly light soy sauce with a dash of sesame oil. And these are the famous chicken rice balls. They are about the size of a ping-pong ball and have this soft and sticky consistency that binds the rice grains together. It’s strong enough so that you can pick it up easily with chopsticks yet it melts away in your mouth. The taste of the rice balls is a gently fragrant one but it lingers in the mouth and you just keep popping in more of those rice balls! Needless to say this is why I keep coming back for it. The story goes that the rice balls were invented because they stayed warm longer and were easier to transport, so farmers and labourers would pack them into wooden containers and take them out to the plantations to eat. 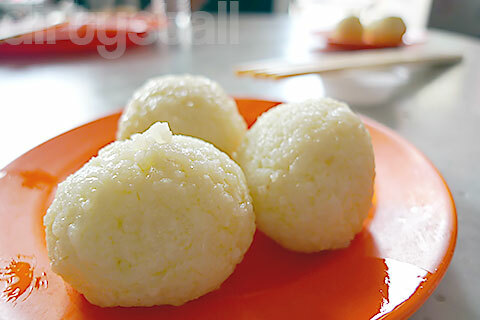 Whatever the truth is, now we have these delicious chicken rice balls that you shouldn’t miss if you’re visiting Melaka! 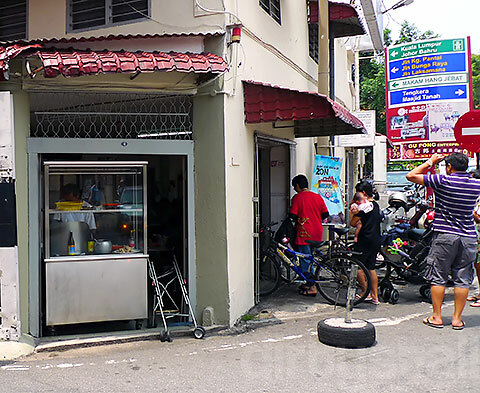 8 Responses to "[Melaka] Chop Chung Wah Hainanese Chicken Rice Ball"
have you tasted the chicken rice balls at dickson road? Not yet, is it delicious? I heard there’s also chicken rice balls at Braddell but haven’t gone to try it either. I’ve tried this! One of the best in Malacca 🙂 Yummm. Yah I don’t really like the others along Jonker Street! This brings back such fond memories! I always eat here when I’ve a chance to visit Melaka! Same here! I always visit it when I’m in Melaka!